Lemon Bay Playhouse presents "Annoyance"
For the opening production of its 31st Season, the Lemon Bay Playhouse will present “Annoyance”, written by Sam Bobrick. This “adult” comedy, directed by Michele Strauss, will open on September 6 and run through September 24, 2017. Audiences will enjoy the twists and turns of this clever comedy. In the first scene a very annoying man goes to see a woman therapist in the hopes that she will help him become less annoying. He drives her over the edge. In the second scene he sees her husband, also a therapist, and drives him over the edge. In the third scene he sees both therapists, who have decided to take drastic measures to rid the world of this most obnoxious man. Of course it doesn&apos;t go as planned. This show contains some adult subject matter and language. The director remarks that the title of this play, “Annoyance”, says it all. Michele asks, have you ever noticed that some people are gifted with the capability of getting on our last nerve ending, making us go mad with frustration? She notes that this play explores the dynamics between an annoying person and not just one, but two perfectly sane individuals, who are appointed with the task of helping this annoyance to become normal. When it appears that they may be less than successful, the theme of the play poses an all too real and powerful question: Can a sane person really aid an annoying person to become normal, or does an annoying person make a perfectly sane person lose their grip on reality? 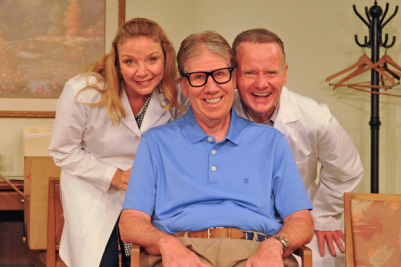 This play is a hilarious adult comedy that takes a mature look at the effects frustrating people can have on typically normal ones. They say that 1 in 3 people are extremely annoying. So, look to your left, then look to your right. If both of the people you are sitting between look normal, then...wink, wink, nudge, nudge!